Orders will begin shipping October 1st. 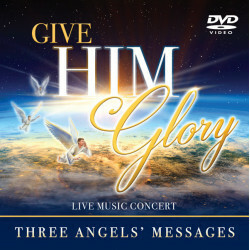 Combo includes both the Give Him Glory CD and the Give Him Glory DVD. The three angels’ messages of Revelation 14 have been set to music! Give Him Glory features some of Christian music’s top composers, arrangers and singers who join together to worship our Creator God. Join Danny Shelton, Julie Goss, Ryan Day, The Aeolians from Oakwood University, and the rest of the 3ABN musical family on an unparalleled journey. It is a worship experience you won’t want to miss! Give Him Glory is a CD that will usher you into the Throne Room of God. The gifts of several composers and arrangers have been optimized in these songs, including Lanny Wolfe, Danny Shelton, David Huntsinger, Jim Gray, Russell Mauldin, Aaron Wilburn, David Clydesdale, and Kris Wilkinson. The songs are not self-promoting performances, they are a call to worship our Creator God. The 3ABN audience will be introduced to some new artists, like Ryan Day and Julie Goss. Wintley Phipps, will also be offering his powerful vocals into the mix. The Aeolians from Oakwood University, under the direction of Jason Ferdinand, are featured on this anointed project. Additionally, you’ll hear many voices from our 3ABN family of artists, including Danny Shelton, Melody Shelton Firestone, John Lomacang, CA Murray, Tammy Chance, Tim Parton, and Yvonne Lewis-Shelton. 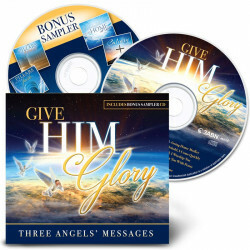 Give Him Glory features lyrics derived from Scripture, elegant orchestrations, and gifted singers and musicians who will lead you into an unparalleled worship experience.